The Veys Bay, previously studied within the BRANCH programme, is affected by many issues. 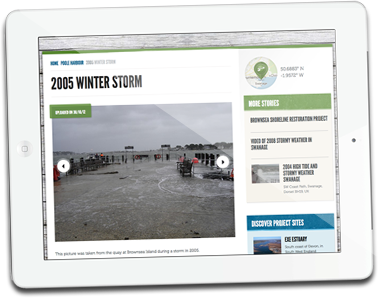 The estuary, exposed to the phenomenon of tidal flooding, raises questions in terms of both shoreline management as well as management of the adjacent land situated below sea level. Located within the Manche department, land in the Bay of Veys has been heavily reclaimed since the middle of the 19th century. Between 1856 and 1972, hundreds of hectares were reclaimed within the bay and they are protected by more than 18km of embankments. Land reclamation has led to a significant reduction in the area of saltmarsh. Over the past forty years, the sedimentary regime has enabled the development of approximately thirty metres of saltmarsh. However, this has not meant a return to the baseline conditions in terms of biodiversity. The bay has a varied landscape (prairies, crops, drained wetlands, polders – some of which are cultivated, some not, dune cordon, saltmarsh, beach). It is a popular area for fauna (Harbour Seal) and migratory birds (Oystercatcher, Ringed Plover, Dunlin, Eurasian Curlew). The issues on this site are associated with the presence of embankments protecting the polders which form an ecological discontinuity between the intertidal and terrestrial habitats. 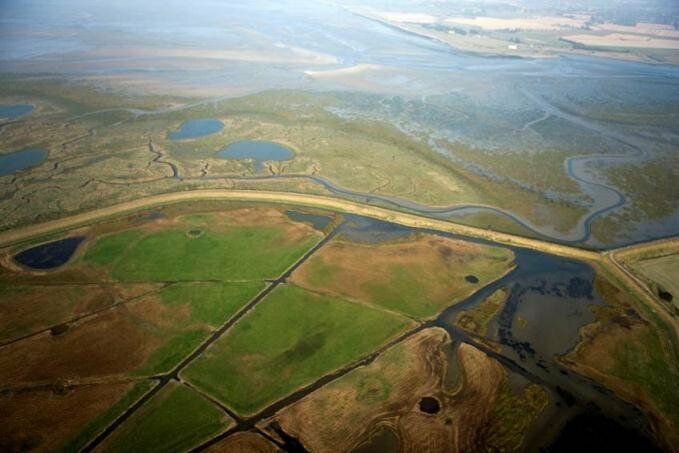 The Conservatoire du Littoral owns six polders in the Bay of Veys, covering an area of 257ha. In the light of the natural evolution of the bay and sea level rise, the key environmental issues are associated with the ecological function of the site (migratory birds) and more specifically the restoration of the functionality of the estuarine ecosystem and its geomorphological evolution. Indeed, sea level rise would lead to the loss of some of the existing saltmarsh. The issues in terms of land use are associated with sustaining the major economic activities within the bay which are shellfish farming, hunting, agricultural management and professional fishing. There have been numerous studies undertaken on this site, especially through the Branch project (Interreg 3b), and there is therefore a large amount of historical data available (terrestrial habitats, fish, benthos, birds, topography). These data will be complemented by an initial monitoring of the ecosystem and by a sociological approach which will allow the development of suitable tools for raising awareness and monitoring. The major objective of LiCCo for this site is to raise awareness among local stakeholders so that they anticipate global phenomena in their management approach.